The Committee on the Future of Nursing 2020-2030 is holding three regional meetings to hear from you. The committee is interested in your insights on how to advance the profession of nursing to help our nation create a culture of health, reduce health disparities, and improve the health and well-being of the U.S. population in the 21st century. Each meeting will feature panel discussions around a specific topic, followed by time for public comments. We hope you can join us in person! Can’t attend? The events will be webcast, and select online comments will be read aloud. An ad hoc committee under the auspices of the National Academies of Sciences, Engineering, and Medicine will extend the vision for the nursing profession into 2030 and chart a path for the nursing profession to help our nation create a culture of health, reduce health disparities, and improve the health and well-being of the U.S. population in the 21st century. The committee will examine the lessons learned from the Future of Nursing Campaign for Action as well as the current state of science and technology to inform their assessment of the capacity of the profession to meet the anticipated health and social care demands from 2020 to 2030. The role of nurses in improving the health of individuals, families, and communities by addressing social determinants of health and providing effective, efficient, equitable, and accessible care for all across the care continuum, as well as identifying the system facilitators and barriers to achieving this goal. The current and future deployment of all levels of nurses across the care continuum, including in collaborative practice models, to address the challenges of building a culture of health. System facilitators and barriers to achieving a workforce that is diverse, including gender, race, and ethnicity, across all levels of nursing education. The role of the nursing profession in assuring that the voice of individuals, families and communities are incorporated into design and operations of clinical and community health systems. The training and competency-development needed to prepare nurses, including advance practice nurses, to work outside of acute care settings and to lead efforts to build a culture of health and health equity, and the extent to which current curriculum meets these needs. The ability of nurses to serve as change agents in creating systems that bridge the delivery of health care and social needs care in the community. The research needed to identify or develop effective nursing practices for eliminating gaps and disparities in health care. The importance of nurse well-being and resilience in ensuring the delivery of high quality care and improving community health. In developing its recommendations for the future decade of nursing in the United States, the committee will draw from domestic and global examples of evidence-based models of care that address social determinants of health and help build and sustain a culture of health. Join the conversation using #FutureofNursing2030 on Twitter! In 2009, the Robert Wood Johnson Foundation partnered with the Institute of Medicine to produce The Future of Nursing: Leading Change, Advancing Health, which set a vision for nursing in 2020. The authoring committee produced a set of recommendations for the field of nursing and it provided a blueprint for improving nurse education; ensuring that nurses can practice to the full extent of their education and training; providing opportunities for nurses to assume leadership positions; and improving data collection for policymaking and workforce planning. 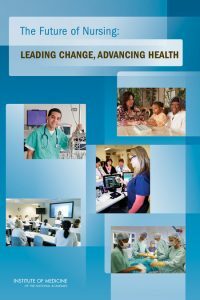 A variety of current and emerging issues influence the field of nursing, from ongoing health care reform and integration of new technologies to patient-centered care to respect for the profession and its expertise, merit exploration and consideration in setting national priorities for the next ten years. Additionally, nurses serve in many community settings; therefore, the nursing profession is well-positioned to serve an important role in implementing the Robert Wood Johnson Foundation’s vision for a Culture of Health. For full biographies of the committee members, please visit the Committee Roster.